In the last few days we began our island wide Alcid (puffins, guillemots and razorbills) monitoring. 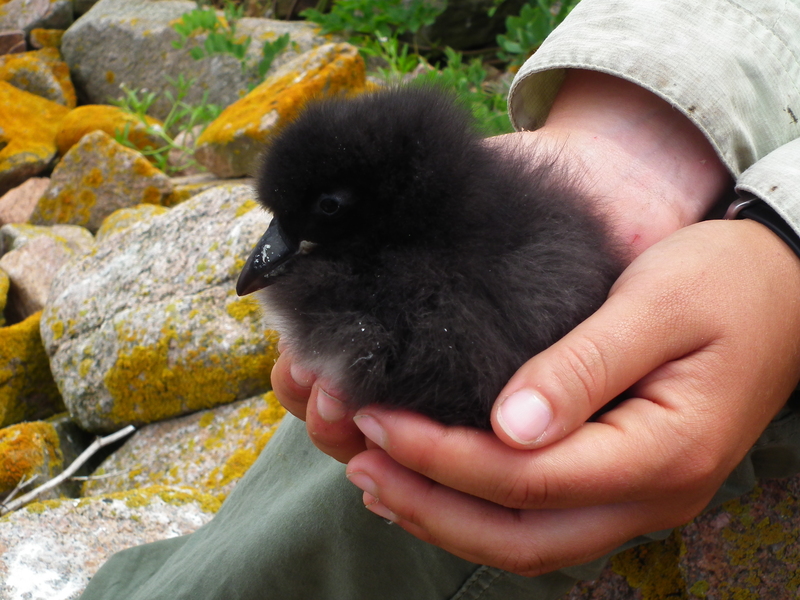 This means we get a look at our first puffin and razorbill chicks! At the beginning of the season we searched within the rocks, ledges and debris around the edge of the island for burrows of Alcids. After marking their nests, we planned to return once the chicks hatched. Alcids are burrow nesters, meaning they lay their eggs inside a tunnel or crack in the rocks or soil. This keeps the eggs and chicks safe from most predators and also keeps the temperature for incubation fairly steady. Puffins and razorbills put all their eggs in one basket (so to speak) and lay only one egg in their burrows, while guillemots lay two. It’s interesting to note that guillemot eggs and razorbill eggs are speckled white and puffin eggs are solid white. I wonder why that is? While we were checking alcid burrows Jordan came across a beautiful find. 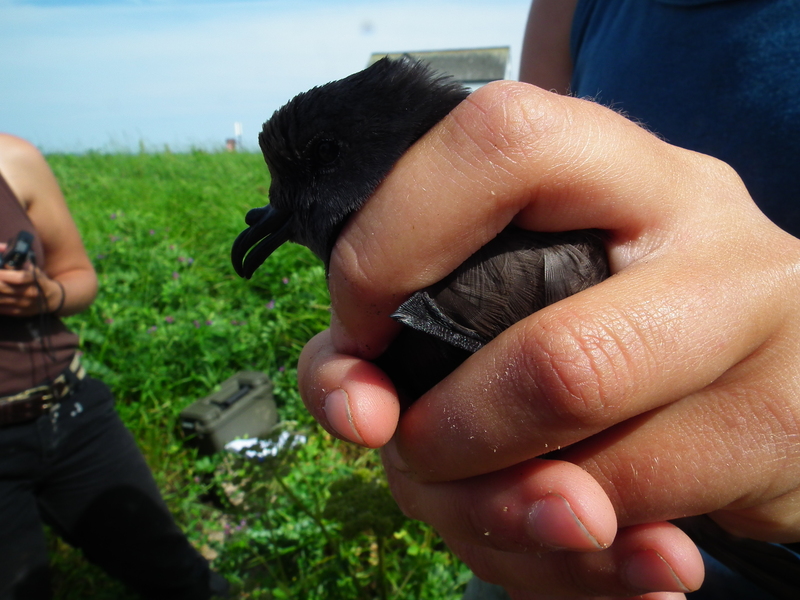 A leach’s storm-petrel! (see above photo) These strange pelagic seabirds nest throughout Petit Manan in burrows dug into the soil and sod. At night we can hear their strange calls that sound a lot like giggling. They are truly mysterious and beautiful creatures! With the season coming to a close we are saying goodbye to our field tech and friend Andrea. It’s been a great summer with all four of us here and we are sad to see her go. Andrea will be getting back to school this fall at Umaine where she is studying Zoology with a focus on seabirds. Good luck Andrea! Our first reachable chicks, Ally and Barnabas, are really growing! When they first hatched 2 weeks ago they weighed 40g and have now reached 230g! Their diet is mostly rock gunnel along with herring that is delivered by both parents to them in the burrow. 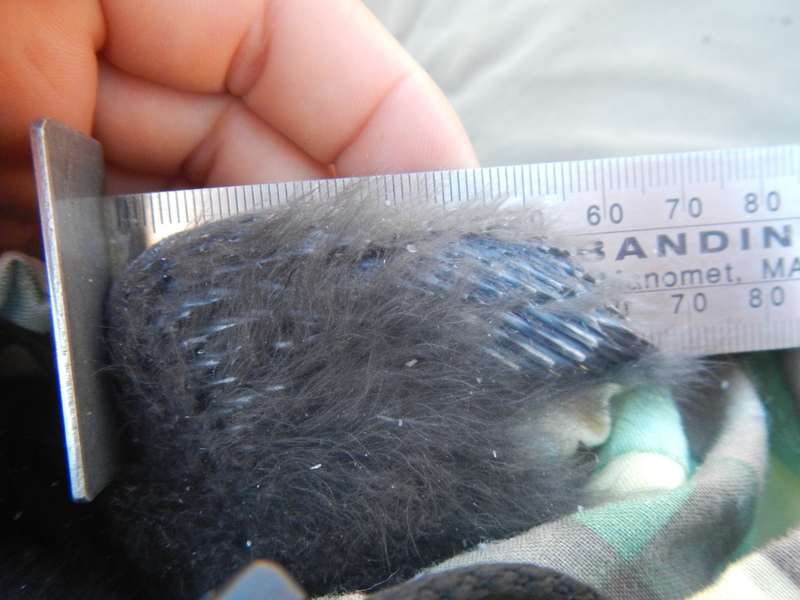 Along with their weight gain they are gaining pinfeathers on their wings which is the beginning of their juvenile molt. We are finding new chicks that have hatched almost every other day! We now have 11 chicks that we are collecting data from and we’ve noticed adults delivering food to several other unreachable burrows. 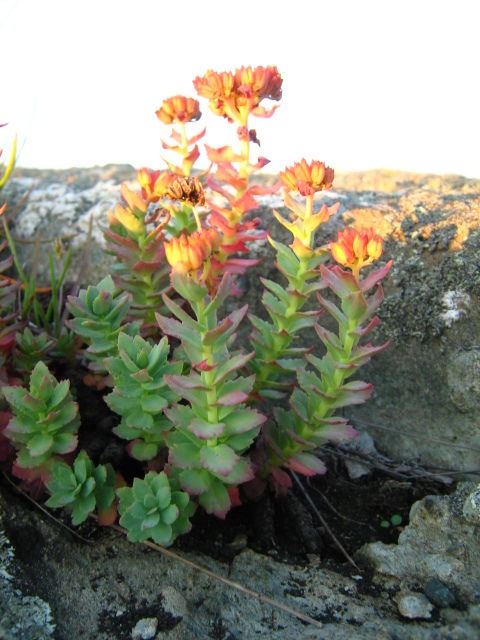 In our free time we have been identifying plants around the islands and have tasted several of the edible plants. There is a variety of berries on the island including raspberries, cranberries, blueberries, bearberry, and crowberry. Mary made a tart jam by combining the cranberries from last year, which are still on the plant, with honey and lemon. We have tried the leaves of rose root and seaside plantain and the inner stalk of bull thistle. 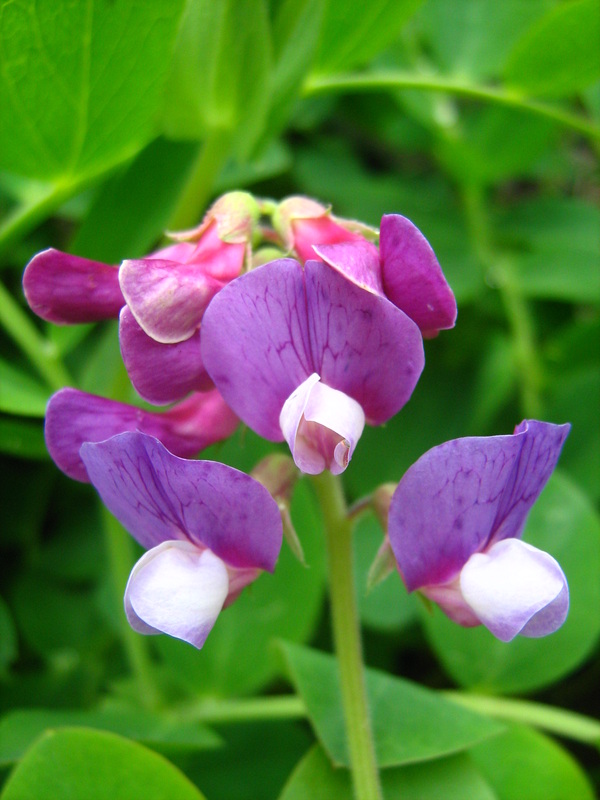 There are also some beach pea pods, raspberries, and bearberries that will soon be ripe! We have decided that since we are essentially living in our own society, that we can create and celebrate our own holidays. Yesterday was our 14th of July celebration (combining National Guillemot Day and the Fourth of July), where we grilled and set off sparklers! 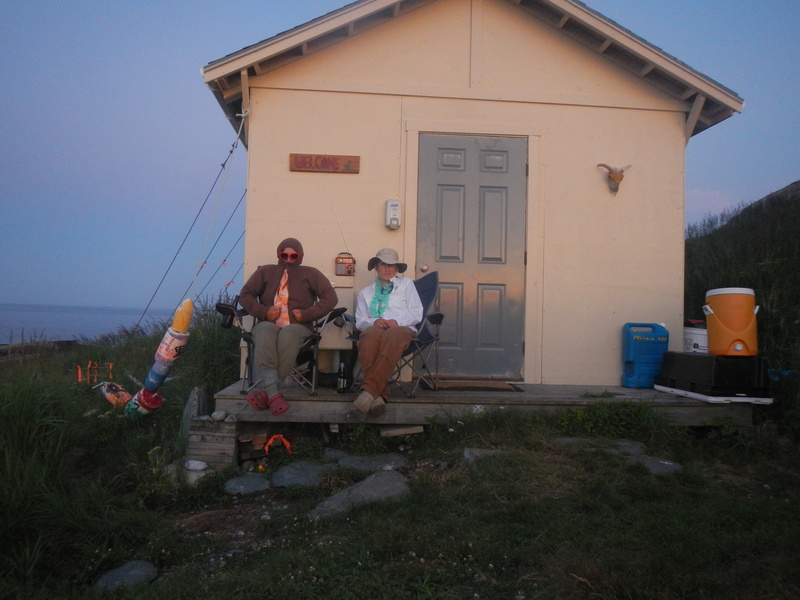 Enjoying the sunset in front of our freshly painted cabin on the 14th of July! I can’t believe the season is more than halfway over! Yet there is still so much to observe and enjoy here on Petit Manan island. Recently we have begun to see the first of the arctic migrants, such as dowitchers and sandpipers. We have even seen some wandering passerines like mockingbirds, mourning doves and a fledgling robin. It says something about islands life when seeing a robin is a big surprise! 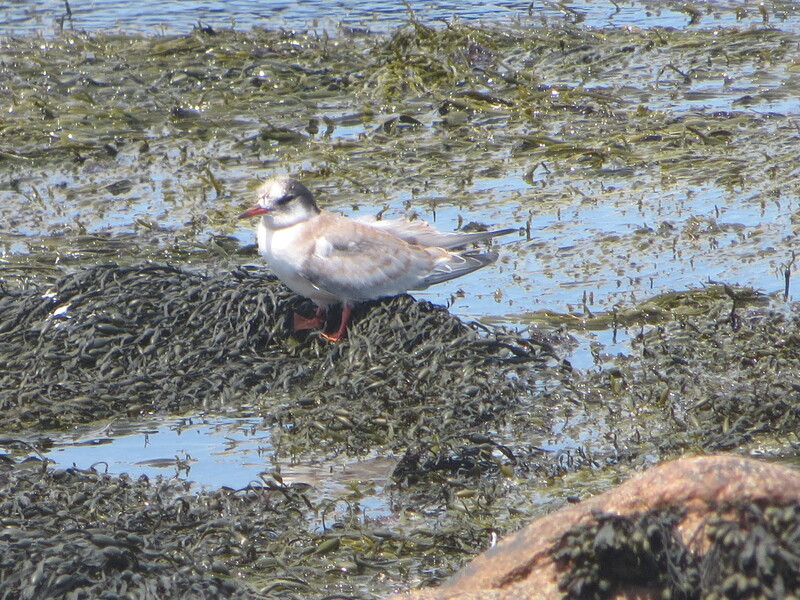 Unfortunately, the terns have had a rather bad stretch of luck. The combination of bad weather, predation and (seemingly) lack of food have had a huge impact on chick numbers. Parts of the island have done better then others. However, the colony doing okay. We even have a few fledglings flying around! Most disconcerting, for us researchers, has been watching the great blacked-back gulls swooping in and picking off tern chicks. They are efficient predators. It is equal parts interesting and terrifying to see them hunting. 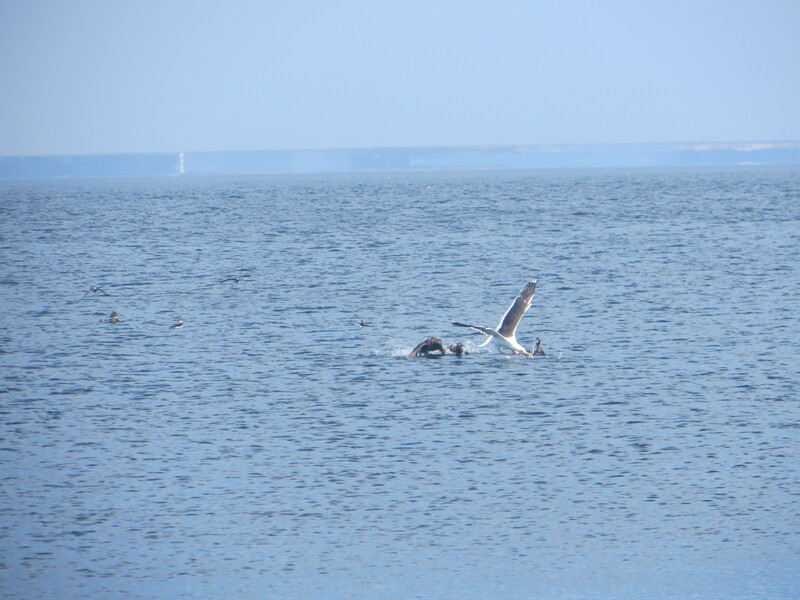 Jill got a great photo of one taking an eider duckling, so you can see one in action below. This weekend we have been joined by Bangor high-school student Max. He’s been an excellent addition to the crew and has been a great help with our research. 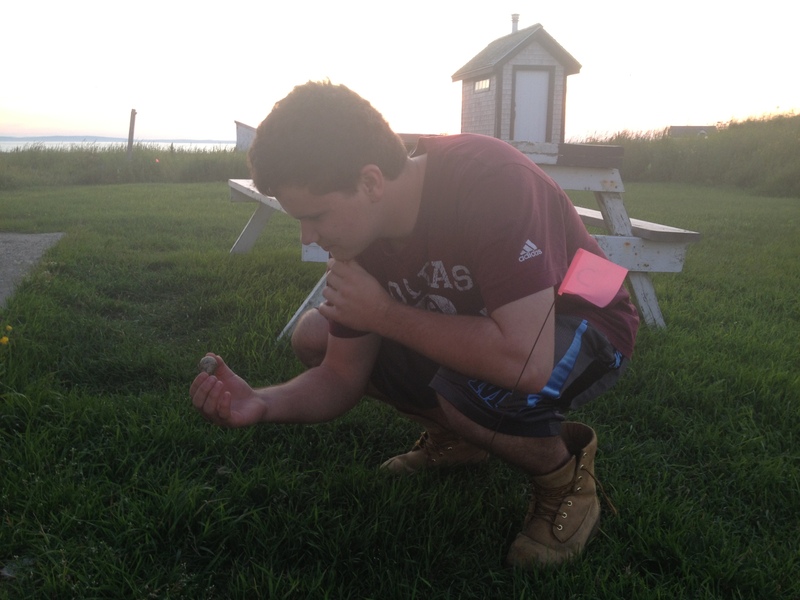 Here he is examining a tern egg this evening. Savannah Sparrows are without a doubt our most common songbird. They are found mostly in the relatively open portions of the island and build grass nests directly on the ground. 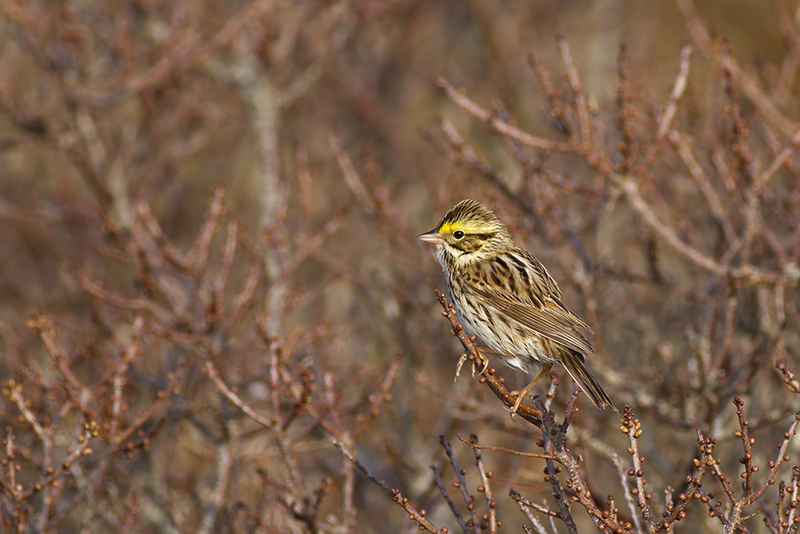 We wake up every morning to their buzzy songs – one Savannah Sparrow in particular has claimed the top of our outhouse for his favorite singing perch. A cousin of the Savannah Sparrow, the Song Sparrow is also quite common on Metinic. They’re a bit drabber – no flashy yellow eyebrows here – but their song is much more melodious. 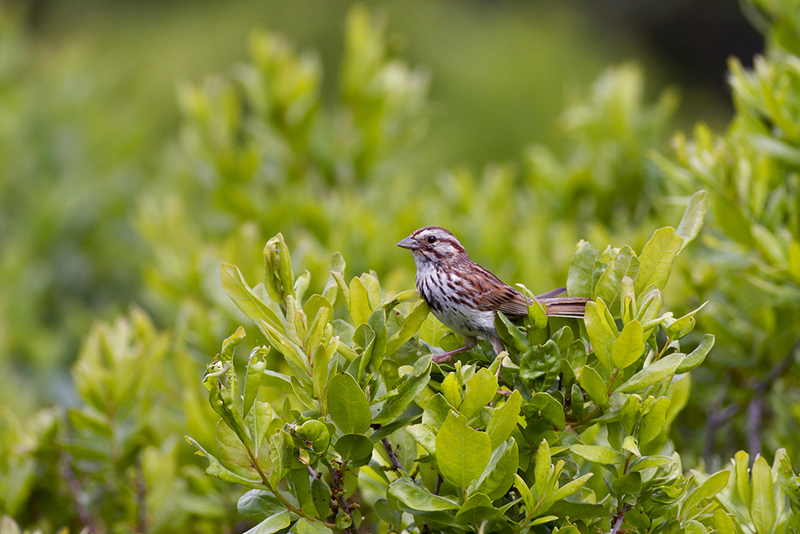 Song Sparrows also prefer shrubbier habitat than the Savannahs. Our first truly forest-dwelling species of the day: a Myrtle Warbler. 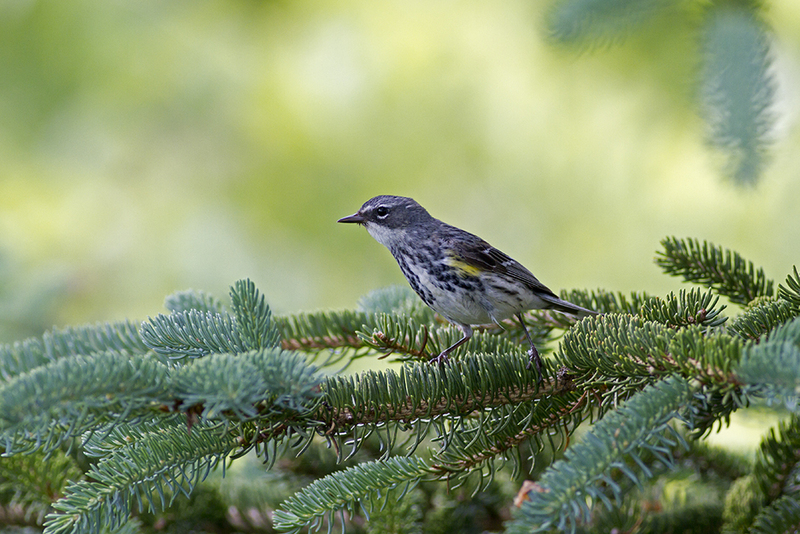 These lovely little birds are lumped together with the Audubon’s Warbler as a single species, the Yellow-rumped Warbler. These brightly colored “butter butts” (as some birders like to call them) are found throughout the Metinic woods, particularly around the edges. Metinic is home to two champion singers: the Winter Wren and the Gray Catbird. 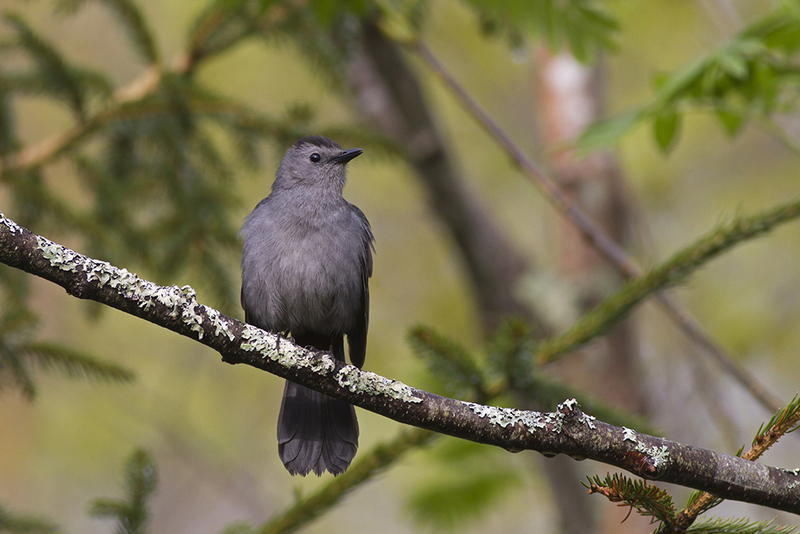 The Catbird knows the most songs of any bird on the island – although some might say he cheats, since he’s a mimic. Listening to a Catbird you can pick out any number of other bird songs from his enthusiastic solo concerts. You might also hear the occasional cat-like “meow” that gives this bird its name. The Winter Wren, on the other hand, composes and performs his own music. 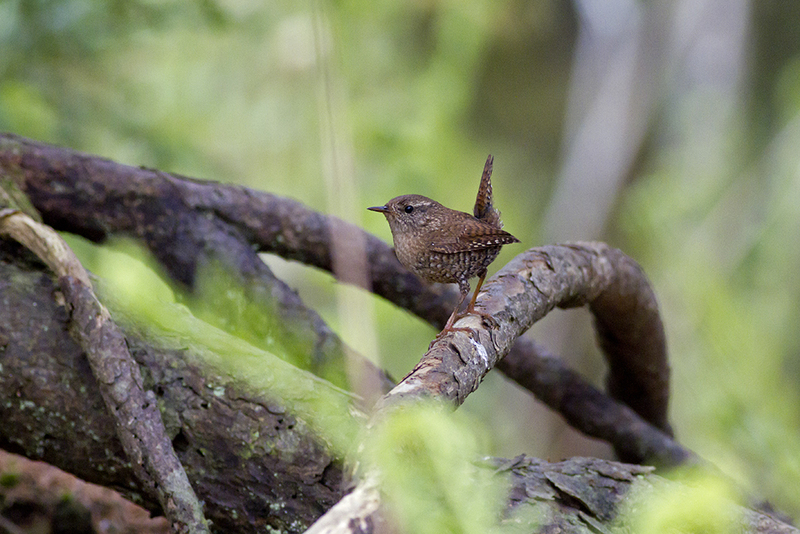 There may only be one or two Winter Wrens on the island, but we can hear them all over the woods. Our last and smallest (but not least!) bird for today is the fiery-headed Golden-crowned Kinglet. These tiny birds make their home in Maine year-round – they’re one of the smallest birds to spend the winter this far north. They’re even smaller than Maine’s ubiquitous Black-capped Chickadees! We spotted their cousin, the Ruby-crowned Kinglet, earlier in the season as well, but only the Golden-crowned decided to stick around for the summer. 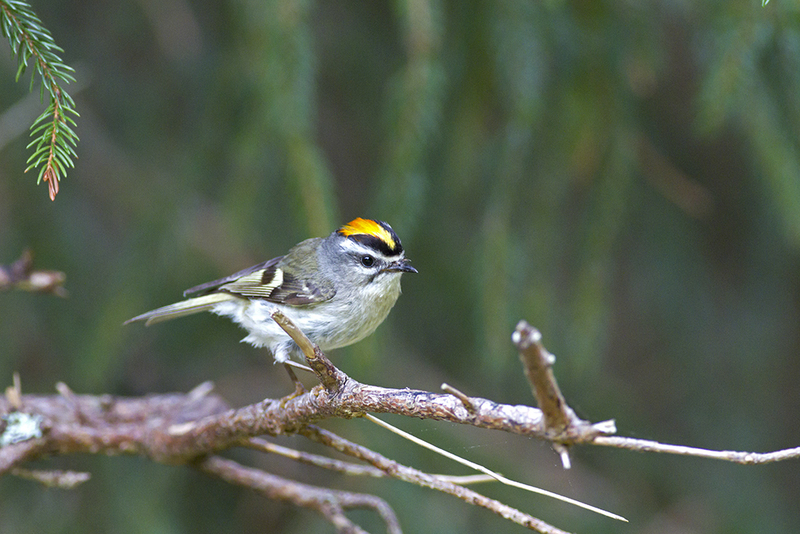 Check out that bright orange and yellow crown the kinglets use to attract mates and scare away competition! The season may be drawing to a close, but you haven’t heard the last from Metinic 2013! Common Tern not liking that I am taking his picture! Hello from Ship! 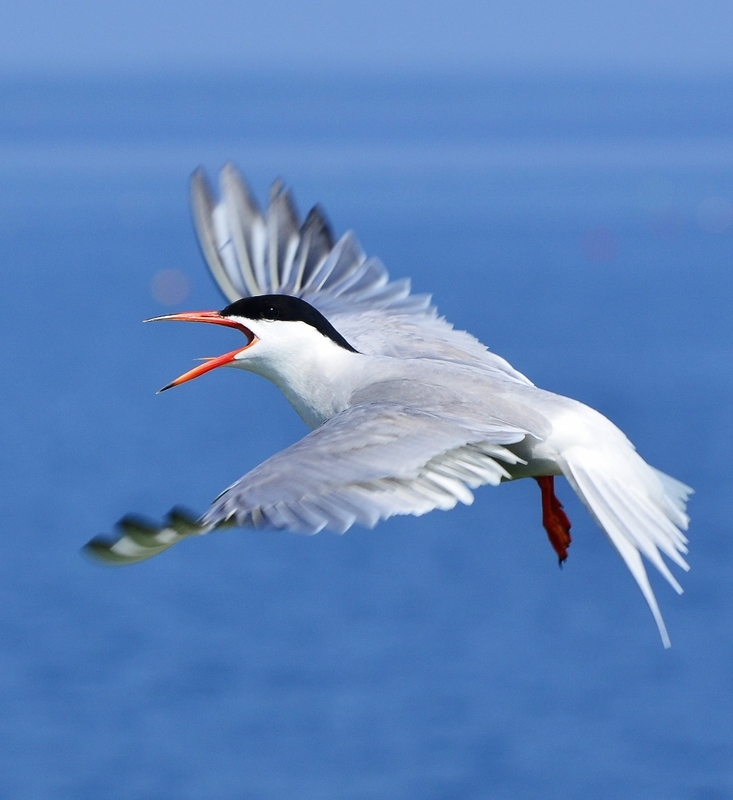 Unfortunately, we don’t have any glorious food updates (though the adult terns are bringing in a lot of tasty fish! ), but, we can report that we have little chicks everywhere! They come in all shapes and sizes, from seabirds, to shorebirds, to passerines, to ducklings. 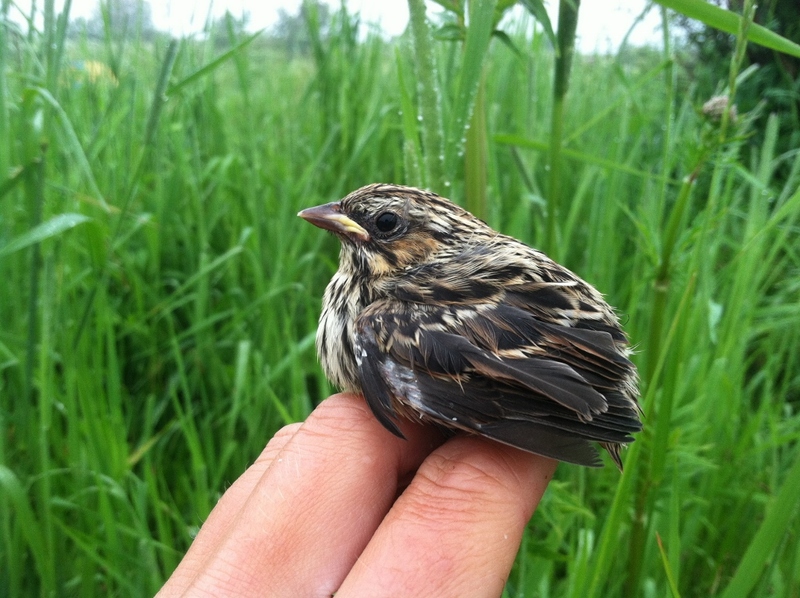 Savannah Sparrow fledgling; basically a little ball with mouth and feathers. Like Petit Manan Island, we have been noticing the vast variety of plumage colorations exhibited by the chicks, even within one family! Featured below are two chick siblings with different colorations. Chicks range anywhere from a warm sandy tan, to seaweed brown, to a silvery tan. They can have very dark well-defined spots or hardly any spots at all. All of these colors help them blend into their environment. The two below are already getting their juvenile feathers and are around 15 days old. Chick siblings exhibiting some of the plumage color variations. 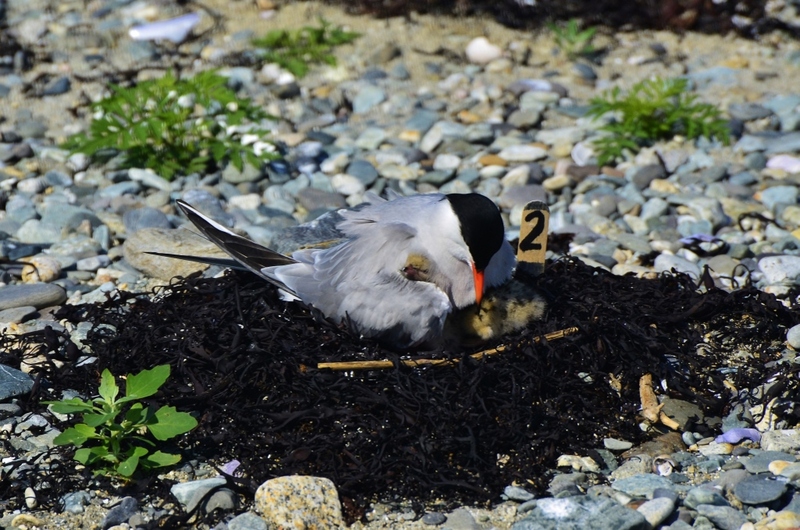 Two of Ship’s posts ago, I posted a picture of an adult tern sitting on “Nest Two.” I am happy to report that they now have three little chicks! They are part of our feeding study. Here is a parent with one of the chicks. Nest 2 parent with chick. And lastly, here is a spotted sandpiper nest with 3 chicks! One of them is very freshly hatched and is still wet from coming out of the egg. 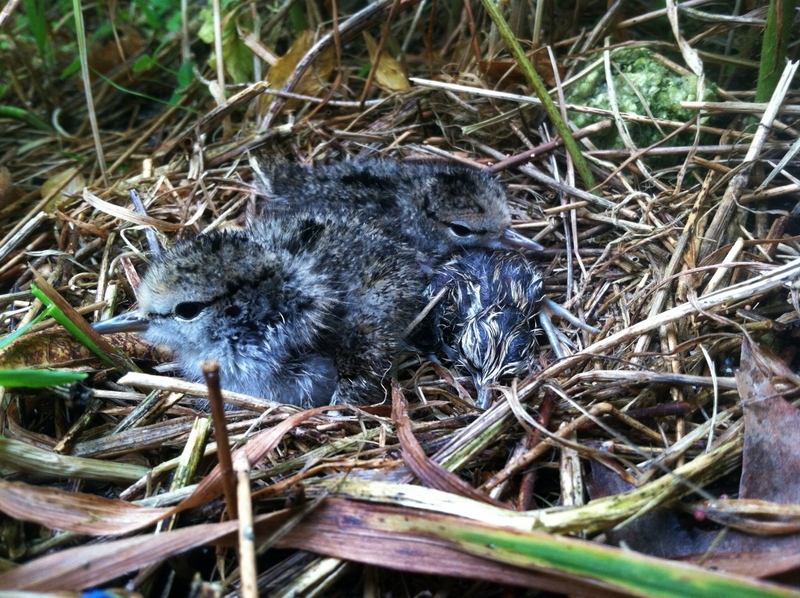 Sandpiper chicks are very mobile quite soon after they hatch, so we were lucky to witness these. Spotted sandpiper chicks in the nest. Zak and I got a tasty surprise yesterday from our neighbor Gene: a bucket of lobsters! We threw them straight into a pot and had ourselves a feast. We’re usually not the most sophisticated cooks out here (after reading their latest entry, I’d say Petit Mana takes that prize!) – pasta, hot dogs, and rice and beans are typical Metinic meals – so we were extra happy with such delicious fare. 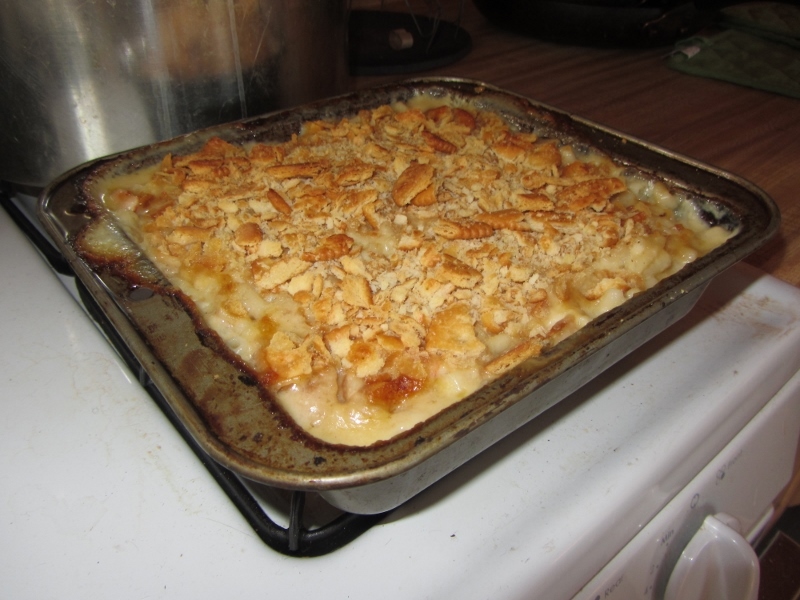 I whipped up some lobster macaroni and cheese (my favorite food of all time), while Zak ate his straight off the plate (plus a bit saved for later). Thanks again to our wonderful neighbors! 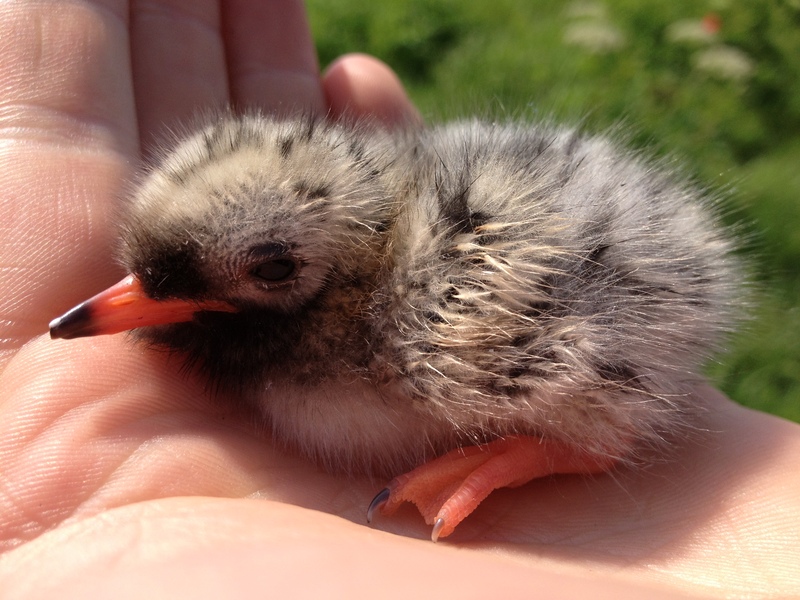 Here on Petit Manan Island we have been very busy with census and tern chicks! Our first chicks hatched on June 17th and it’s amazing to see how fast some have already grown. We especially appreciate the diversity of colors in our chicks. Some have a mottled brown plumage, while others are silvery grey. Even within a clutch, brother and sister may have very different colors. In a couple of weeks (around 21 days) those chicks will fledge. It will be interesting to watching them grow and develop over the coming month. 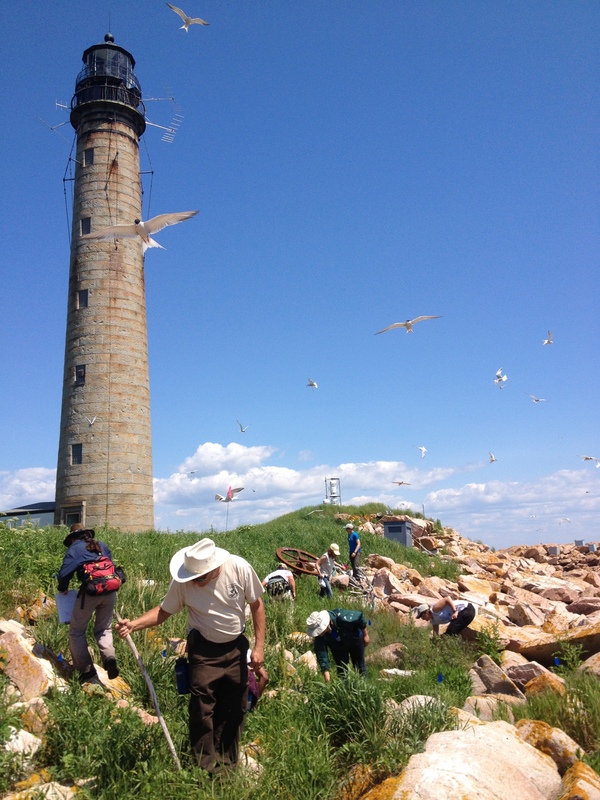 Over the week we spent two days conducting our island wide seabird survey. Biologists, staff and SCA students joined us from the mainland, and it was great fun to have everyone out for a few days. 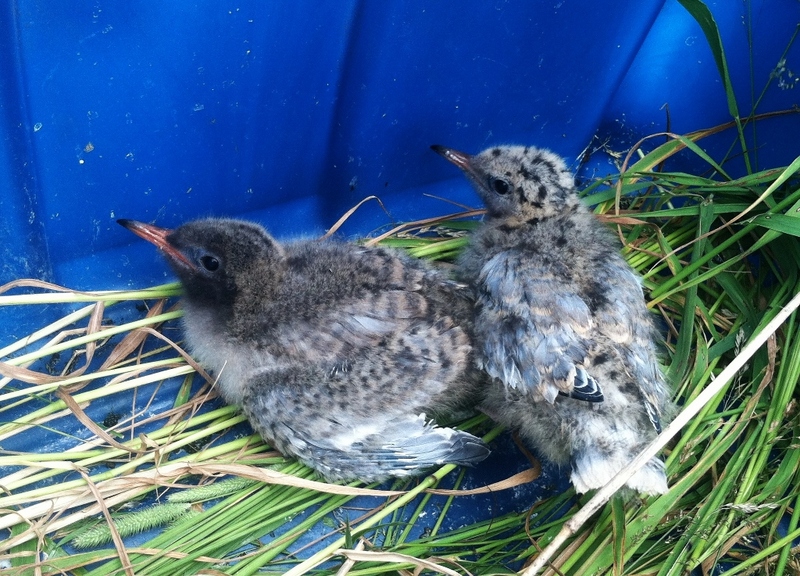 After adding up our numbers we found that the total number of nesting terns is down this year, unfortunately. Despite not know why numbers are down, we are confident that the nests we have are doing very well and are off to a great start. We have also been very busy making delicious food here on Petit Manan. Yesterday evening we gathered periwinkles, dulse and mussels for our dinner. 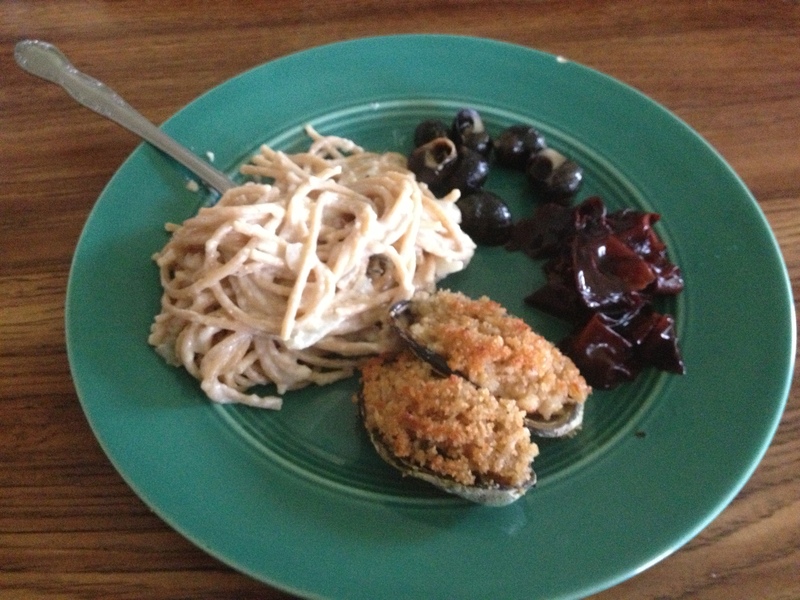 Jill made her special Alfredo sauce to go along with some pasta and we had ourselves a feast. Surprising to some, periwinkles are quite easy to cook and delicious!